There is a certain type of knitter out there. They long for thin yarn, tiny needles, and charts, oh the charts… 60 yards of bulky yarn? Wasted on them! They want hundreds of yards of fine fine yarn, preferably in a solid or a subtle hand dye to show off their pretty yarn overs and ssks. Natural fibers only please, acrylics just won’t block. What items would this type of knitter crave? 1. Lace yarn of course! A couple of skeins of Malabrigo Lace would make a mighty shawl at a reasonable price. A range of colours for every pallette and a single ply and loft that makes the finished product light as air. 2. Blocking wires: I have come to believe that no knitter should be without them but none more than the lace knitter. 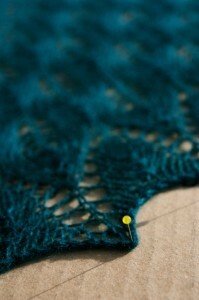 Lace really looks like a whole lot of nothing until it has been properly (and in my opinion vigorously) blocked. The pattern comes alive and the stitches start to make sense after a SOAK bath, some wires, and some T-Pins. Did I mention T-Pins? Get an extra pack for your knitter’s stocking, you really can’t have too many. 3. A great lace pattern: try some Brooklyn Tweed. Rock Island has lace on both sides of the work, a challenge for anyone! 4. Addi Lace Needles: I just won’t knit lace on anything else. They are a little ‘stickier’ so your yarn doesn’t slide off the needles and their sharper point, while dangerous, will help you keep those stitches in line. This entry was posted on Friday, December 21st, 2012 at 2:55 pm	and is filed under Uncategorized. You can follow any responses to this entry through the RSS 2.0 feed. Both comments and pings are currently closed.